Ideal to set on your book shelf just waiting for the time to perform a miracle. 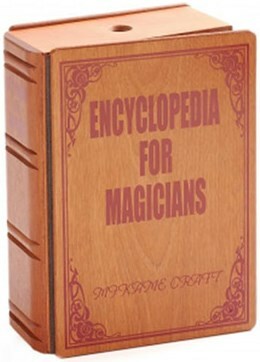 It appears to be an Encyclopedia for Magicians down to every detail. The front and back covers are actually swinging doors. This Encyclopedia is a 'Flip Over Box', but with a big improvement. The wooden back door is shimmed with metal. You are supplied with SIX Neo magnets 5/8 inch thick.This shimmed door and Neo magnets make your production possibilities endless!